Luke Wright made a memorably succinct contribution to England's World Twenty20 victory over Australia - his solitary over of the tournament produced the wicket of Cameron White and stifled the run-rate with five singles. Today, however, he didn't have to wait nearly so long to get involved, as Andrew Strauss called him into action in the 14th over, midway through the bowling Powerplay. With visible self-belief, he bounded to the crease with the vigour of a Labrador puppy, removed Tim Paine with his second delivery, then had Ricky Ponting caught at fine leg for initial figures of 3-1-7-2. For all his indubitable class, Michael Clarke has never quite convinced as a limited-overs batsman, and as captain in the Caribbean recently, he singled himself out as a scapegoat after coming in at No. 3 in the final and plodding his way to a run-a-ball 27. So, what is there to say about his latest effort - 87 not out from 97 balls? On the one hand, it met the needs of his team entirely, as he stabilised the innings from a dicey 98 for 4, and enabled Australia to bat out the remaining 28 overs of their innings. On the other hand, it lacked a critical final measure of oomph, as 12 singles and a two from his final 13 balls would testify. With better support, it might not have mattered, but in a new-look side, the onus was on Clarke to be anchor and impetus. It was left to England's Irishman to demonstrate how to recover a one-day innings, from a near-identical scoreline of 97 for 4. Eoin Morgan waited 19 balls today for his first boundary, a bout of circumspection that compared to his 27-ball wait during his Test debut against Bangladesh last month. But whereas on that occasion, he gave his start away with a loose dab on 44, this time he ground urgently through the gears to leave the Aussies needing (and lacking) inspiration to dislodge him. He broke the run-chase with 10 fours in the space of his next 34 balls, the most audacious of which was a flippant uppercut for a one-bounce four over third man. The remainder of the innings was a cruise, but he still sealed it in style with an 85-ball hundred. Kevin Pietersen is playing his last "home" international at the Rose Bowl, after the announcement that he will be leaving Hampshire at the end of the summer. In five-and-a-half seasons, he has managed seven Championship matches, 17 List-As and two Twenty20 appearances, so this hardly amounted to a teary-eyed farewell, but it ought to have been more anticlimactic than his eventual 29 from 36. While still on 0, and facing up to Ryan Harris, he played loosely away from his body for Paine to claim what sounded like a faint snick. The umpire was unmoved, but later Snickometer replays suggested KP was a bit lucky. Last month, the 21-year-old Steven Finn announced himself as the next big thing in England's bowling ranks, as his 6'7" frame routed Bangladesh in consecutive Tests at Lord's and Old Trafford. Though he's now being hidden during this five-match Ashes appetizer, the Aussies have had no such qualms about blooding their own lanky rookie, with the 19-year-old Josh Hazlewood becoming the youngest ODI debutant in their history. At 6'5", he is a fraction shorter than Finn, but on initial inspection, he's no less a prospect. 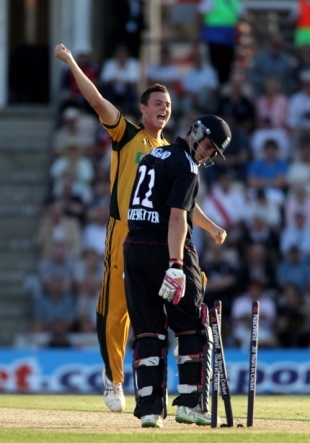 He started nervously as Pietersen crunched his first ball for four, and eventually conceded 41 in seven overs. But his cross-seam cutter to bowl Craig Kieswetter was a peach, and it was notable that Ponting trusted him with a slip in a hunt for mid-innings wickets. On this occasion, the ploy failed, but many fine careers have been launched in defeat. On the day that George Osborne announced stringent cuts in the government's emergency budget, the Rose Bowl authorities were on hand to demonstrate that not everyone's purse-strings require the same amount of tightening. The summer solstice has only just passed, and with the sun eventually setting at 9.23pm this was in fact the third-longest day of the year, not to mention one of the hottest. There wasn't a whole lot of need for the floodlights that blazed away from the end of Australia's innings, and didn't really play any significant role until the final 15 overs of England's run-chase. Still, they looked impressive, as indeed did the rest of the ground. Nine years after its inauguration, Hampshire's international venue is finally coming into its own. Andrew Miller is UK editor of Cricinfo.